For Bournemouth only in Premier League the most goals scored: Callum Wilson 12 goals, Joshua King 11 goals. Team the most matches played with formation: 4-4-2. Bournemouth at home won 7 matches, 5 draws and 5 defeits. Bournemouth scored average of 1.44 goals per game. In matches played at home 1.71 goals per game. In matches played at home an average of 3.12 goals (with opponent goals). For Newcastle United only in Premier League the most goals scored: Jose Salomon Rondon 9 goals, Ayoze Perez 7 goals. Team the most matches played with formation: 5-4-1. Newcastle United away won 3 matches, 7 draws and 7 defeits. Newcastle United scored average of 0.94 goals per game. In matches played away 0.76 goals per game. In matches played away an average of 2.06 goals (with opponent goals). Before the game team Bournemouth in table was 12, Newcastle United was: 15. The match ended with the result 2:2. For Burnley only in Premier League the most goals scored: Ashley Barnes 10 goals, Chris Wood 10 goals. Team the most matches played with formation: 4-4-2. 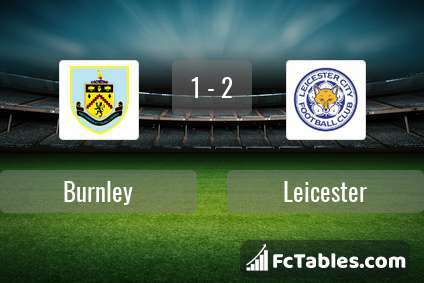 Burnley at home won 7 matches, 2 draws and 8 defeits. 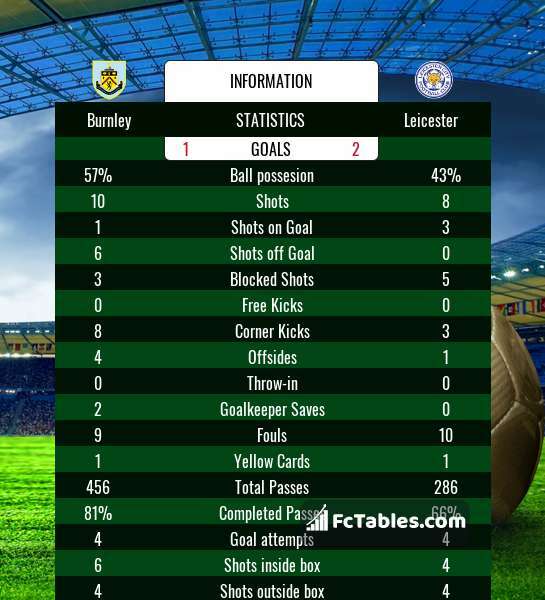 Burnley scored average of 1.24 goals per game. In matches played at home 1.35 goals per game. In matches played at home an average of 3.00 goals (with opponent goals). For Leicester only in Premier League the most goals scored: Jamie Vardy 15 goals, James Maddison 7 goals. Team the most matches played with formation: 4-2-3-1. Leicester away won 7 matches, 3 draws and 7 defeits. Leicester scored average of 1.35 goals per game. In matches played away 1.47 goals per game. In matches played away an average of 2.94 goals (with opponent goals). 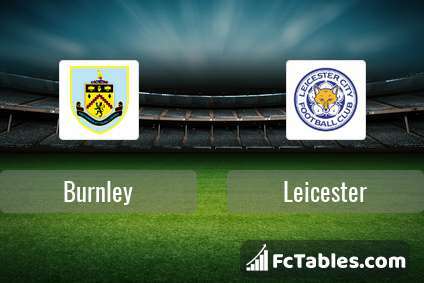 Before the game team Burnley in table was 14, Leicester was: 7. The match ended with the result 1:2. For West Ham only in Premier League the most goals scored: Felipe Anderson 9 goals, Marko Arnautovic 7 goals. Team the most matches played with formation: 4-2-3-1. West Ham at home won 8 matches, 3 draws and 6 defeits. West Ham scored average of 1.24 goals per game. In matches played at home 1.59 goals per game. In matches played at home an average of 3.06 goals (with opponent goals). For Huddersfield only in Premier League the most goals scored: Aaron Mooy 3 goals, Mathias Joergensen 3 goals. Team the most matches played with formation: 4-2-3-1. 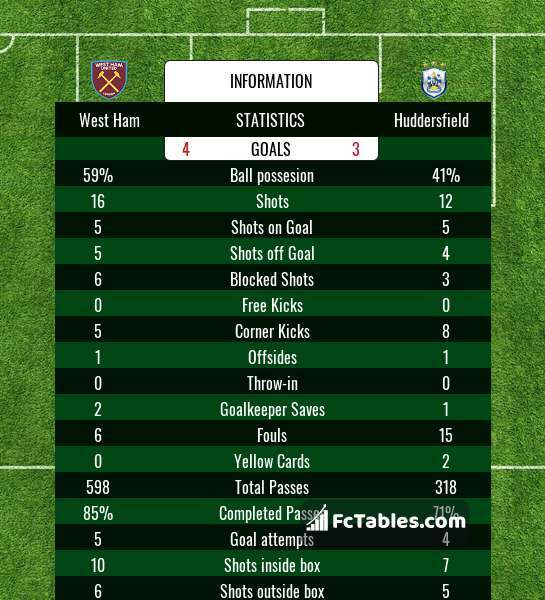 Huddersfield away won 1 matches, 3 draws and 13 defeits. Huddersfield scored average of 0.56 goals per game. In matches played away 0.65 goals per game. In matches played away an average of 2.94 goals (with opponent goals). 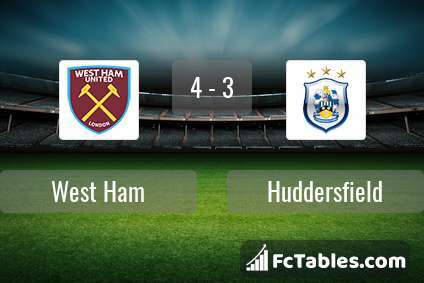 Before the game team West Ham in table was 11, Huddersfield was: 20. The match ended with the result 4:3. For Everton only in Premier League the most goals scored: Gylfi Sigurdsson 12 goals, Richarlison 12 goals. Team the most matches played with formation: 4-2-3-1. Everton at home won 8 matches, 4 draws and 5 defeits. 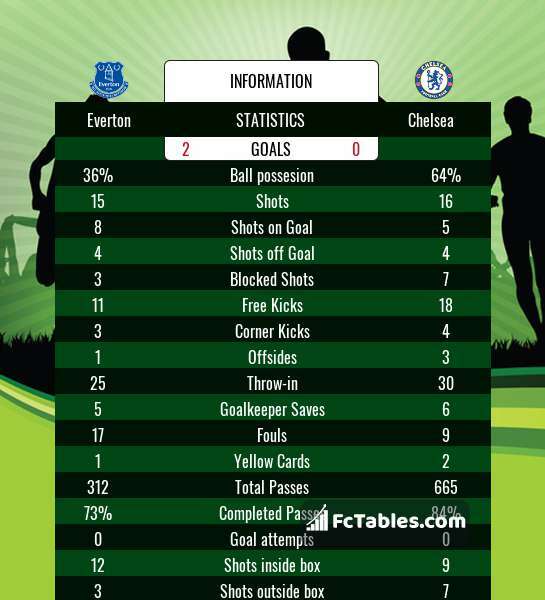 Everton scored average of 1.35 goals per game. In matches played at home 1.41 goals per game. In matches played at home an average of 2.65 goals (with opponent goals). For Chelsea only in Premier League the most goals scored: Eden Hazard 16 goals, Pedro Rodriguez 8 goals. Team the most matches played with formation: 4-3-3. Chelsea away won 9 matches, 1 draws and 7 defeits. Chelsea scored average of 1.68 goals per game. In matches played away 1.35 goals per game. In matches played away an average of 2.88 goals (with opponent goals). 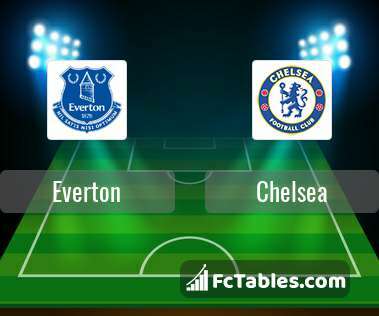 Before the game team Everton in table was 9, Chelsea was: 5. The match ended with the result 2:0. For Fulham only in Premier League the most goals scored: Aleksandar Mitrovic 10 goals, Andre Schuerrle 6 goals. Team the most matches played with formation: 4-2-3-1. Fulham at home won 5 matches, 3 draws and 9 defeits. Fulham scored average of 0.94 goals per game. In matches played at home 1.24 goals per game. In matches played at home an average of 3.12 goals (with opponent goals). For Liverpool only in Premier League the most goals scored: Mohamed Salah 19 goals, Sadio Mane 18 goals. Team the most matches played with formation: 4-3-3. Liverpool away won 11 matches, 5 draws and 1 defeits. Liverpool scored average of 2.26 goals per game. In matches played away 1.71 goals per game. In matches played away an average of 2.29 goals (with opponent goals). Before the game team Fulham in table was 19, Liverpool was: 1. The match ended with the result 1:2. For Brighton only in Premier League the most goals scored: Glenn Murray 11 goals, Shane Duffy 5 goals. Team the most matches played with formation: 4-3-3. Brighton at home won 6 matches, 4 draws and 7 defeits. 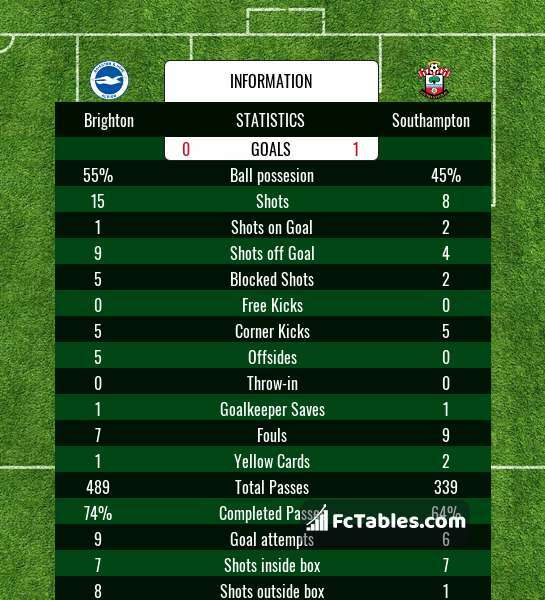 Brighton scored average of 0.97 goals per game. In matches played at home 1.00 goals per game. In matches played at home an average of 2.35 goals (with opponent goals). For Southampton only in Premier League the most goals scored: Danny Ings 7 goals, Jamie Ward-Prowse 6 goals. Team the most matches played with formation: 4-2-3-1. Southampton away won 4 matches, 3 draws and 9 defeits. Southampton scored average of 1.18 goals per game. In matches played away 1.00 goals per game. In matches played away an average of 2.75 goals (with opponent goals). 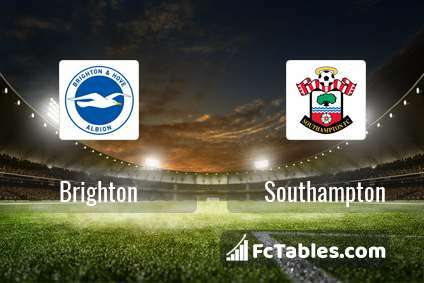 Before the game team Brighton in table was 17, Southampton was: 16. The match ended with the result 0:1. For Wolverhampton Wanderers only in Premier League the most goals scored: Raul Jimenez 12 goals, Diogo Jota 7 goals. Team the most matches played with formation: 3-4-2-1. Wolverhampton Wanderers away won 5 matches, 5 draws and 7 defeits. 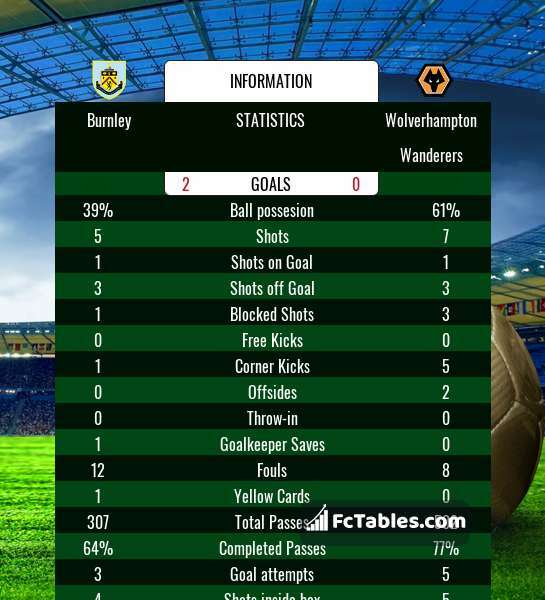 Wolverhampton Wanderers scored average of 1.24 goals per game. In matches played away 1.00 goals per game. In matches played away an average of 2.29 goals (with opponent goals). 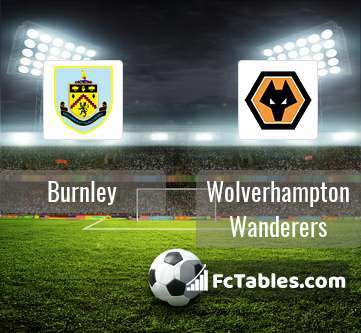 Before the game team Burnley in table was 14, Wolverhampton Wanderers was: 8. The match ended with the result 2:0. For Crystal Palace only in Premier League the most goals scored: Luka Milivojevic 12 goals, Wilfried Zaha 8 goals. Team the most matches played with formation: 4-3-3. Crystal Palace at home won 4 matches, 4 draws and 9 defeits. Crystal Palace scored average of 1.18 goals per game. In matches played at home 0.82 goals per game. In matches played at home an average of 2.00 goals (with opponent goals). Before the game team Crystal Palace in table was 13, Huddersfield was: 20. The match ended with the result 2:0. For Manchester City only in Premier League the most goals scored: Sergio Aguero 19 goals, Raheem Sterling 17 goals. Team the most matches played with formation: 4-3-3. Manchester City away won 11 matches, 2 draws and 3 defeits. Manchester City scored average of 2.61 goals per game. In matches played away 1.94 goals per game. In matches played away an average of 2.56 goals (with opponent goals). Before the game team Fulham in table was 19, Manchester City was: 2. The match ended with the result 0:2. For Leicester only in Premier League the most goals scored: Jamie Vardy 15 goals, James Maddison 7 goals. Team the most matches played with formation: 4-2-3-1. Leicester at home won 7 matches, 2 draws and 8 defeits. 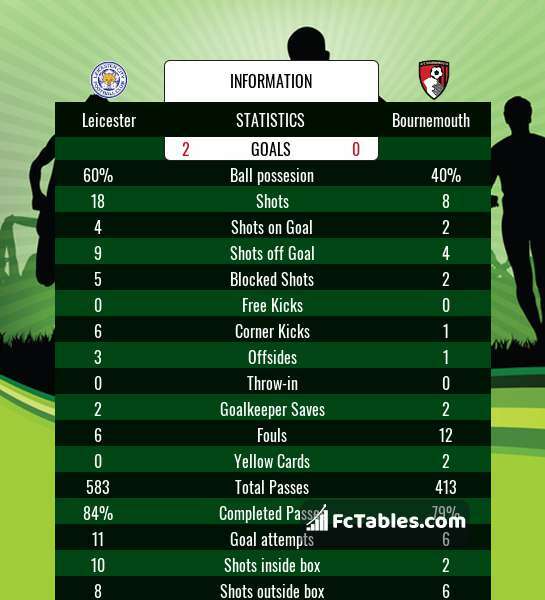 Leicester scored average of 1.35 goals per game. In matches played at home 1.24 goals per game. In matches played at home an average of 2.41 goals (with opponent goals). For Bournemouth only in Premier League the most goals scored: Callum Wilson 12 goals, Joshua King 11 goals. Team the most matches played with formation: 4-4-2. Bournemouth away won 5 matches, 0 draws and 12 defeits. Bournemouth scored average of 1.44 goals per game. In matches played away 1.18 goals per game. In matches played away an average of 3.35 goals (with opponent goals). 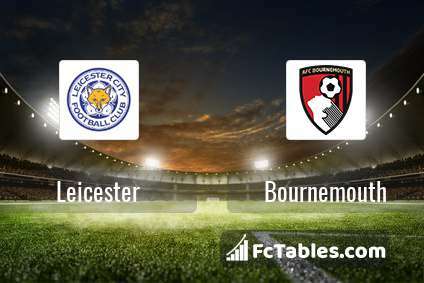 Before the game team Leicester in table was 7, Bournemouth was: 12. The match ended with the result 2:0. For Manchester United only in Premier League the most goals scored: Paul Pogba 13 goals, Romelu Lukaku 12 goals. Team the most matches played with formation: 4-3-3. Manchester United at home won 10 matches, 5 draws and 1 defeits. Manchester United scored average of 1.91 goals per game. In matches played at home 2.00 goals per game. In matches played at home an average of 3.25 goals (with opponent goals). For Watford only in Premier League the most goals scored: Troy Deeney 9 goals, Gerard Deulofeu 7 goals. Team the most matches played with formation: 4-2-2-2. Watford away won 5 matches, 5 draws and 7 defeits. Watford scored average of 1.42 goals per game. In matches played away 1.41 goals per game. In matches played away an average of 3.00 goals (with opponent goals). Before the game team Manchester United in table was 6, Watford was: 10. The match ended with the result 2:1. For Everton only in Premier League the most goals scored: Gylfi Sigurdsson 12 goals, Richarlison 12 goals. Team the most matches played with formation: 4-2-3-1. Everton away won 5 matches, 3 draws and 9 defeits. Everton scored average of 1.35 goals per game. In matches played away 1.29 goals per game. In matches played away an average of 2.65 goals (with opponent goals). Before the game team West Ham in table was 11, Everton was: 9. 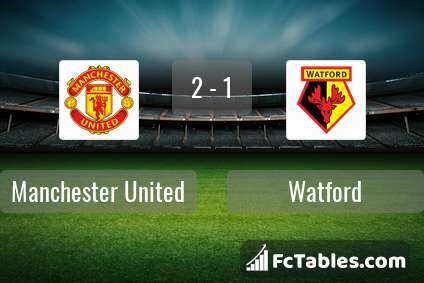 The match ended with the result 0:2.